Dirk Nowitzki had 31 points, 11 rebounds and 8 assists as the Dallas Mavericks stretched their club-record home winning streak to 19 games with a 115-95 victory over the Denver Nuggets on Saturday night. Nowitzki fell two assists short of his first career triple-double and 28th in the history of the Mavericks, who won their 11th in a row overall. The Mavericks are the fourth team in NBA history with three double-digit winning streaks in a season. Dallas already has streaks of 12 and 13 games this season. The Milwaukee Bucks (1970-71), Philadelphia 76ers (1980-81) and Los Angeles Lakers (1999-2000) are the other teams with three winning streaks of 10 or more in a season. 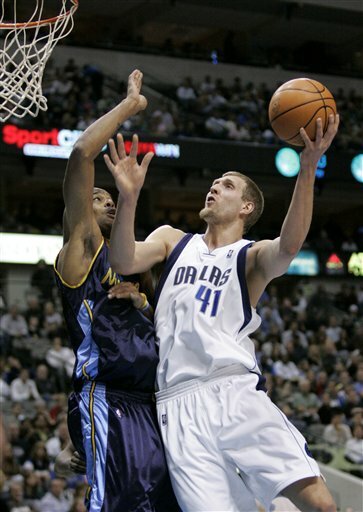 Josh Howard, playing on a sore right ankle, added 27 points for the Mavericks. Jerry Stackhouse scored 16 for Dallas, which has won 46 of 51 after opening the season at 0-4. Carmelo Anthony scored 34 points and Allen Iverson had 26 for the Nuggets, who lost their fourth in a row. Marcus Camby added 10 points and 17 rebounds for Denver. The Nuggets were on the second leg of a back-to-back, having lost 114-104 at Utah on Friday night, and did not arrive in Dallas until 4:30 a.m. on Saturday. Stackhouse's 3-pointer with 5:33 left in the third quarter capped Dallas' 11-2 run as the Mavericks expanded their lead to 77-63. Iverson was so frustrated that he bounced the ball high in the air after Stackhouse's 3, earning a technical foul. Denver coach George Karl earned a technical of his own earlier in the quarter when he complained about an officiating decision. The Nuggets pulled to 88-79 after three quarters, but the Mavericks went on to build leads of as many as 20 points in the fourth. Denver got off to a fast start, taking a 33-29 advantage after one quarter behind Iverson's 13 points. But Dallas used a 31-23 second quarter and got 20 first-half points from Howard, his highest-scoring half of the season, to take a 60-56 lead into the break. Howard made eight straight field goal attempts during one first-half stretch. Notes:@ Antoine Walker had the Mavericks' last triple-double, on Jan. 14, 2004 against Philadephia when he had 11 points, 17 rebounds and 13 assists. ... Dallas hasn't lost at home since a 92-83 defeat to Detroit on Dec. 7. ... The Mavericks were without Devean George (knee). George expects to miss at least two more games with the first knee injury of his career. ... Denver's J.R. Smith is also out with a knee injury. ... The Nuggets have lost 18 of their last 19 games in Dallas.